HUNDREDS OF NEW UTILITY TRAILERS FOR SALE! 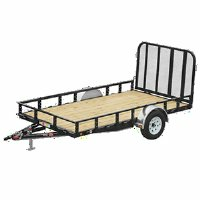 We have over 200 NEW utility trailer for sale and for the lowest prices! Take a look below for high quality utility trailers with great features including aluminum fenders, spring-loaded gates, pipe top rails, swivel jacks and more. We recommend our house brand of eConoBody utility trailers for an unbeatable combination of low price and good quality and local support, or we recommend the PJ or Diamond C channel utility trailers for a top of the line heavy duty utility trailer!